Looking for a great home storage option for your skateboards? 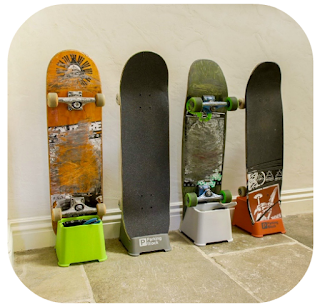 Check out the Parking Block, a new freestanding skateboard display rack designed in California. The Parking Block is really easy to use. It's a rectangular base piece with an open front lip to slide your skateboard deck in and out of, whenever you're ready or finished with using it. It accommodates a complete skateboard - not just decks only - so it's a great storage solution for your home. Save your walls the scuff marks that accumulate from leaning your board against the wall. The Parking Block will keep your board upright, but freestanding, so no wall scuffs. 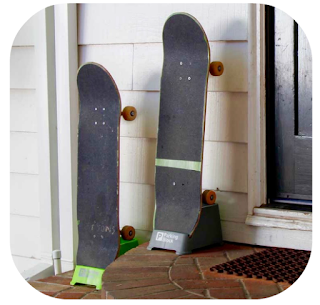 Because it's lightweight and portable, you can use and move the Parking Block all over your house - move it from the garage, to mudroom, bedroom, basement, porch, anywhere you want to store your skateboard. It comes in 4 colors too, so it'll fit anywhere you need it (gray, green, red, white). Of course, because it's freestanding, there's no mounting, drilling, or installation needed. Set it up and it's no-slip feet will keep your skateboard in place. A great alternative to traditional, wall mounted racks or other racks that only hold decks. Check out the Parking Block!